Ultra high-end tube EQ for mixing and mastering. Officially licensed and endorsed by Manley Labs, the Manley Massive Passive EQ plug-in expertly captures the behavior of the original hardware, from the unusual filter curves, to the multiple band interdependencies, right down to the tube amplifier distortion, and all-important transformer/inductor hysteresis. The two-channel, four-band Manley Massive Passive tube EQ utilizes design strengths from choice console, parametric, graphic, and Pultec EQs — delivering sweet, musical curves with unparalleled clarity and headroom. The “Passive” in the Manley Massive Passive refers specifically to the tone shaping elements of the equalizer, which use only resistors, inductors, and capacitors to create all frequency changes. Its Frequency controls intentionally interact with one another, as do the Gain and Bandwidth controls, allowing for the Massive Passive’s natural and organic sound. Painstakingly modeled by Universal Audio and rigorously scrutinized by Manley Labs for authenticity, the Manley Massive Passive EQ plug-in captures the hardware’s unique filter curves and musical distortion. 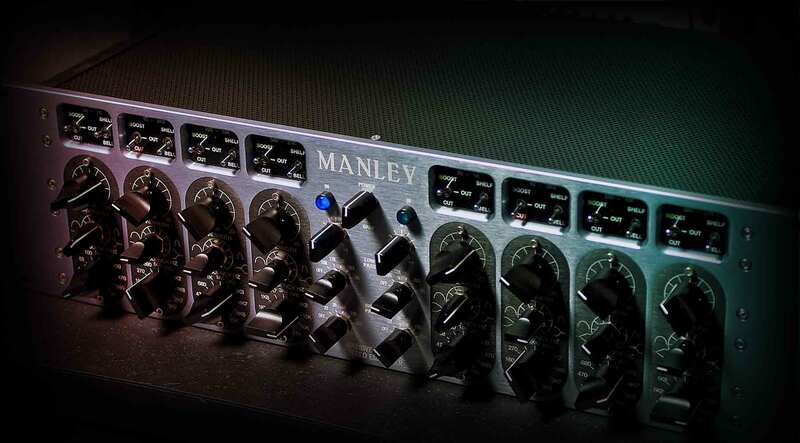 The Manley Massive Passive EQ plug-in offers a Standard version that offers continuous Bandwidth adjustment, and a Mastering version that includes 16 steps of easily recallable Bandwidth selections. Perfect for subtle or broad strokes to individual instruments or whole mixes, you can add presence and sizzle without harshness to drums and vocals, or add weight and heft to an entire mix without muddying the bottom end. ...but when it fits - it fits. Never been in the position to use a real one, but I am totally happy with this one. massive passive - sounds great! Just started to use it on mastering tracks. Love it. It's subtle and easy to use. Thanks for the great gear! This a super sweet eq. Very suttle, but perfect for mastering. The top end adds sizzle without being harsh. Highly recommended! ...but when it fits - it fits. Never been in the position to use a real one, but I am totally happy with this one. What can I say? This the EQ I use on all my most important tracks in every project I ever do. And often an instance on the master as well. This is perfect for the shaping and kneading to get a sound to have the right shape, right character. Very transparent. Love the parallel setup. Give it a bit of extra headroom if the magic isn't happening. Recommended. Just started to use it on mastering tracks. Love it. It's subtle and easy to use. Thanks for the great gear! This plugin is going to make me buy 2 octos and a 2nd apollo quad so I can use one on every track. Sound like the the real hardware. I can confirm that! Incredible emulation. This one is just about indistinguishable from the real thing (in fact, despite having extensive experience with the real thing, to my ears it is)... Some things are a just slightly a little less than the real MP, but this also seems to have a bit of smoothness or sheen somewhere that the real MP doesn't. Hands down an acceptable alternative considering the price difference and ability to run multiple instances (well, sort of... I have a UAD-2 quad and can only run a small handful of these and other plugs). Excellent new addition to part of my "mastering chain" though, and hats off to UA and Manley for accomplishing a truly impressive feat. This has got to be the best EQ plug I ever used. Never used the HW unit also, but even if theyÂ´re not similar, it doesnÂ´t matter. ItÂ´s easy to use, quick to get the best results, and it smokes the competition - even UAD other EQs, more often than not. Not the kind of fix-this-terrible-loop EQ, more like a fine tuning tool. I donÂ´t master stuff a lot, but been using the MP to sculpt vocals, and bought it straight away just for its magic at that. I donÂ´t see myself mixing vocals in the box without this plug anymore, itÂ´s really a game changer. The only reason it doesnÂ´t get 5 stars is that itÂ´s a huge CPU hog to the point it brings trouble to your workflow. "Massivo" the EQ superhero does it again..... in the digital realm! This godzilla esque eq shocked the world when it first entered the hardware realm with its organic, larger-than-life component network of sound and now it is happening again with software. I own the hardware and have had to patch with this thing for years and believe me, it is time consuming! Now I can leave Massivo on my master output and mix with the software, SAVING TONS OF TIME. This plug-in is so close to the original. There is a different energy when you push the software compared to the original, but this only applies for certain types of hard driven music. The filters are fantastic and sound exactly like the hardware. I use them more than anything. Overall I am very impressed with this plug-in and now a proud owner of both the hardware and software. Thanks once again Universal Audio for making my life easier! What can i say. Anything is too less. Just got the demo, tried it and boom!!!. really high DSP consuming. But, hey, quality has a price. and hear the "no distortion". sounds better than its usages. Sound wise its very good but on the downside it uses so much dsp which makes it hard to put in a chain many times. 2 words: Buy it! Need more words? Alright, how about this: It's the unrivaled champion of Equalizers. It imparts a super-smooth sound to anything it touches, and you can apply extreme cuts or boosts without ever getting a harsh or nasty sound due to the way the bands interact. The bands are very flexible and can act in shelf or bell mode, with configurable bell shape (Q) and, more interestingly, configurable shelf shape where you can change it so that it's not a pure shelf but actually giving it some interesting shapes that allow you to cut or boost without muddying or creating hollowness in nearby frequencies. Additionally, all the bands of the unit interact and can be combined around the same frequency ranges for amazing effects thanks to the unique curves this provides. It comes in a mastering and regular version. You NEED this! I sorta wish I could have my money back on this one. I regret buying it based on the hype, and not demoing it out. People talk about how smooth it is, but it's sorta brittle sounding to me, not very 3 dimensional nor round. I think the top sounds thin, and for low stuff the neve plugs are just straight up better. For the top, and brightening things up in a plug I would recommend the Maag, it's way better, furthermore the dsp usage on this thing is kinda monstrous. The upsides is, that the lowpass filter is pretty solid. I love the Manley EQ for mastering, especially the low end but I like to read DBs added or subtracted. It'll be great to have that on the UAD version. For smooth but heavy low end and mid rage Manley EQ tops them all.